Amshewitz was the son of a noted Rabbi, scholar and lecturer at Montefiore College, England. His precocious talent attracted the attention of leading Academicians, and in 1902 he won a scholarship to the Royal Academy schools, aged 23, where he studied under John Singer Sargent, Sir George Clausen and Solomon J. Solomon. In 1907, the year that he left the R.A. school, Amshewitz won a major competition to paint four fresco murals for the Centenary Memorial at the Liverpool City Hall, each measuring 25 feet by 6 feet. This was to be the first of numerous important commissions, and in 1910 the artist again executed a large mural for the Royal Exchange, London. As a young artist trying to make ends meet, Amshewitz worked as an illustrator for several weekly journal, and in 1911, the Medici Society commissioned 10 watercolor illustrations for their deluxe edition of Everyman; in fact, illustration was to play an important role throughout several period in the artist’s career. However, it was the high profile commissions that brought considerable recognition, and in 1914 Amshewitz received membership in the Royal Society of British Artists (RBA). Throughout this period, Amshewitz was a regular exhibitor at the R.A. One of his best submissions, shown in 1912, is Death’s Arrest. 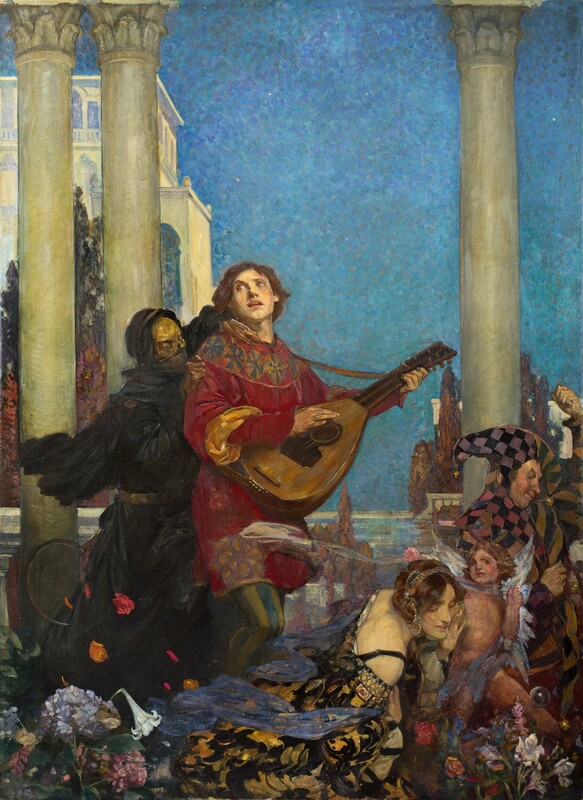 The enigmatic subject of this large and theatrical canvas shows a young troubadour pursued by the figure of Death. Accompanying him and oblivious to the singer’s plight are a court Jester, Cupid, and a beautiful maiden garbed in fantastical attire who appears to glide mysteriously along the bottom of the canvas. The setting is the garden of an imaginary coastal villa.There is nothing to indicate that Amshewitz was acquainted with the contemporary American painter and illustrator Maxfield Parrish (1870 – 1966), but their large canvases share numerous affinities, including the use of distinctive saturated hues and idealized neo-classical imagery. In 1916, having been rejected for military service due to an injury incurred while executing the Liverpool murals, Amshewitz seized upon an opportunity to travel to South Africa for six months in a theatrical production of Potash and Perlmutter, a Jewish comedy written for the Broadway stage a few years earlier. In fact, the artist was to remain in South Africa until 1922, and he returned for a second time in 1936. Amshewitz’s first South African exhibition occurred in 1916 and was followed by many others throughout his lifetime. In 1917, he was elected a member of the South African Society of Artists. He was also a founding member of the Johannesburg Sketch Club, subsequently becoming its President, and served as a mentor and critic to other Johannesburg artists. In 1917, Amshewitz again turned to illustration. He became a cartoonist for the Rand Daily Mail and Johannesburg Sunday Times. Disliking the job and without regular commissions, he sought refuge in easel-paintings depicting allegorical and fantasy themes, often with a strong theatrical effect, and portraiture. In 1922, Amshewitz returned to England, with his South African wife Sarah Briana, who later authored a monograph on her late husband, The Paintings of JH Amshewitz (1951). In England, in 1924, Amshewitz took charge of South African works at the Empire Exhibition in Wembley.During this period he also focused on still life painting, finding inspiration in exotic objects and textures, including Chinese puppets, porcelain, flowers and colored silks and velvets. However, he also continued to exhibit large scale canvases covering a wide range of subjects from the serious (The Comforter, The Rebel, The Reviler, The Golem) to the more lighthearted, such as Spanish dancers, gala nights, Venetian carnivals, Roman festivals and circus scenes. Between 1925 and 1930, Amshewitz produced 20 etchings for inclusion in Fine Prints of the Year, an annual series of books that reported and discussed the etchings, engravings, woodcuts and lithographs published each year between 1923 and 1938 by major artists of the period. These volumes reproduced in monochrome on high quality glossy paper a selection of about 100 limited edition prints published during the preceding year. The series provides an important record of the work of artists in the last years of the etching revival and during the collapse of the market for prints. Amshewitz’s life again turned to South Africa in 1933. Michael Haskel, South Africa’s High Commissioner for Palestine, commissioned the artist to paint three historical murals for South Africa House, London. The following year the same patron requested another monumental canvas, this time for the William Cullen Library at the University of the Witwatersrand, Johannesburg. Amshewitz returned to South Africa to execute Vasco da Gama Leaving Portugal (1936), which depicts Abraham ben Samuel Zacuto presenting his astronomical tables to da Gama, the first European to reach India by sea, before his departure from Lisbon in 1497. Two years later, Amshewitz also completed a mural for the Pretoria City Hall. A few years later the artist’s health deteriorated and the family moved to Muizenberg, a suburb of Cape Town, where he focused on sketches and landscapes. Following Amshewitz death in 1941, a large commemorative exhibition of his work, opened by the British High Commissioner in Pretoria, Lord Harlech, was held at the Johannesburg City Hall. Although Amshewitz only lived in South Africa from 1916 to 1922, and again from 1936 until his death in 1942, he is perhaps best considered a South African artist. In addition to those works mentioned above his paintings can be found in numerous public collection there: South Africa National Art Gallery, Cape Town; Johannesburg Art Gallery; Durban Art Gallery; Pretoria Art Museum; William Humphreys Art Gallery, Kimberley; King George VI Art Gallery, Port Elizabeth; Africana Museum, Johannesburg; and, Albany Museum, Grahamstown. Prior to relining, the reverse of the present canvas was inscribed, “‘No. 3 / Death’s Arrest / by J.H. Amshewitz / 2 Parkhill Studios / Parkhill Road / Hampstead.” Many of the artist’s records were destroyed during the two World Wars, and there is no mention by Sarah Amshewitz of a Parkhill Studio, but this area of London was well known as the home to many artists in the early 20th century. Two blue plaques in Parkhill Road in north London’s Belsize Park — one to the sculptor Henry Moore, the other to the painter Piet Mondrian — tell the story of London’s artistic community in the Thirties. Ben Nicholson, Barbara Hepworth, Naum Gabo and Herbert Read all lived nearby, and in 1938, when Mondrian was coaxed to leave Paris for London, the group found him a studio in Parkhill Road.